Over the course of an eventful first 18 months in office, President Donald Trump’s approval ratings have remained remarkably stable. There has also been a wider gap between Republicans’ and Democrats’ views of Trump than for any other U.S. president in the modern era of polling. Four-in-ten Americans approve of Trump’s job performance while 54% say they disapprove, according to a Pew Research Center survey in June. Trump’s approval ratings have hardly moved in surveys conducted by the Center this year, and his current rating is nearly identical to the 39% who said they approved of his performance in February 2017, shortly after his inauguration. Trump’s steady ratings early in his tenure are unique among recent presidents. And while his ratings are also the most polarized along party lines, this divide represents a continuation of a trend seen in assessments of recent presidents, including Barack Obama and George W. Bush. The growing partisan gap in assessments of U.S. presidents has been driven by more negative ratings among members of the party that’s out of the White House. The 7% of Democrats who approve of Trump is lower than the 14% of Republicans who approved of Obama and the 23% of Democrats who approved of Bush during their respective administrations. 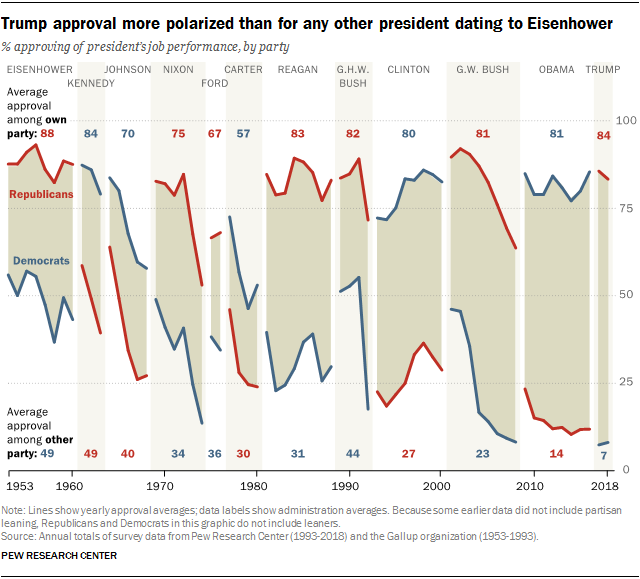 Out-party ratings of the president were higher in previous decades. For example, an average 31% of Democrats approved of Ronald Reagan’s job performance. Looking at approval ratings from individual surveys over time, the trajectory of Trump’s ratings during his first term differs from those of his recent predecessors. Trump began his administration with assessments far lower (39% approval) than those of other recent presidents at the outset of their administrations, including Obama (64% approval) and George W. Bush (53% approval). While Trump’s ratings today are about the same as they were 18 months ago, other presidents saw far more change. Approval ratings for Obama, Bill Clinton and Reagan all moved lower during their first two years in office, and by December of their second years, their ratings were in the low-to-mid 40s. Bush’s approval ratings moved sharply higher in September of his first year – they reached 86% in the wake of the 9/11 terrorist attacks – before beginning to steadily decline. George H.W. 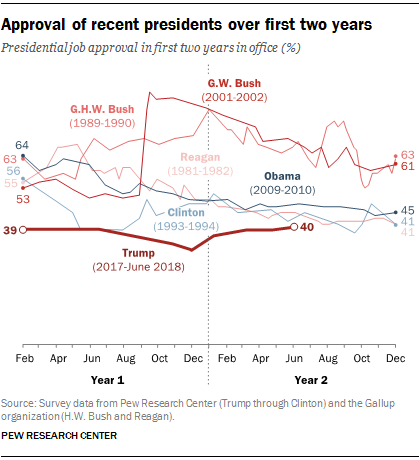 Bush also saw his approval ratings improve in his first year before they turned lower and closed his second year in office about where they had started. Trump’s approval rating is 8 percentage points lower than Obama’s was in June 2010 (40% vs. 48%) – a much smaller difference than was seen at earlier stages of their respective presidencies. 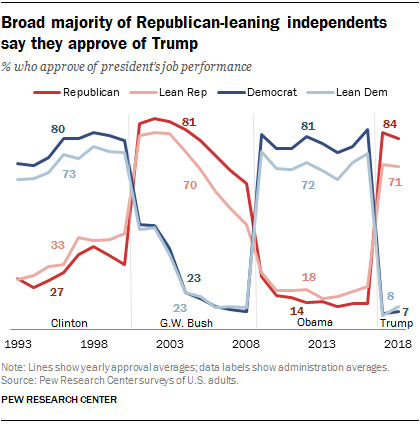 Trump’s approval rating is broadly positive among independents who say they lean toward the Republican Party, though not quite as high as among self-identified Republicans. Through Trump’s first year and a half in office, an average of 71% of Republican leaners approve of his job performance, compared with 84% of Republican identifiers. 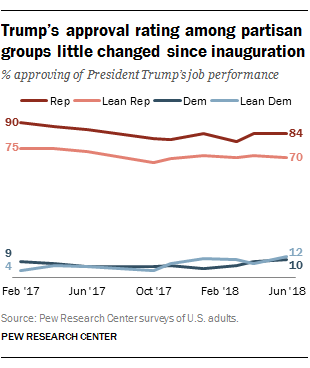 This is broadly similar to patterns in past administrations: During Obama’s time in office, an average of 81% of Democrats approved of how he handled his job, compared with 72% of Democratic leaners. An average of 81% of self-identified Republicans approved of George W. Bush’s job performance, compared with 70% of those who identified as GOP leaners. Very small shares of both Democrats (7%) and Democratic-leaning independents (8%) say they approve of Trump. Similarly, Democratic leaners’ views of George W. Bush closely tracked the views of Democrats during his presidency. For both Obama and Clinton, Republican leaners were modestly more positive in their ratings than GOP identifiers. 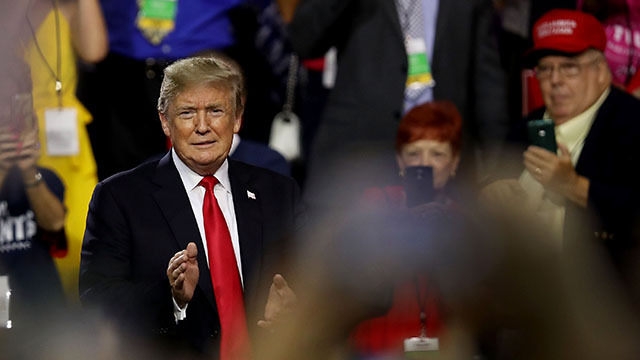 Across individual surveys fielded since he took office, Trump’s approval rating has been largely stable among Republicans, Republican leaners, Democrats and Democratic leaners alike.